There were plenty of reasons to take a break from cycling in Bogota and the five weeks was well spent visiting local sites, schools for talks and riding in the Ciclovia every Sunday. 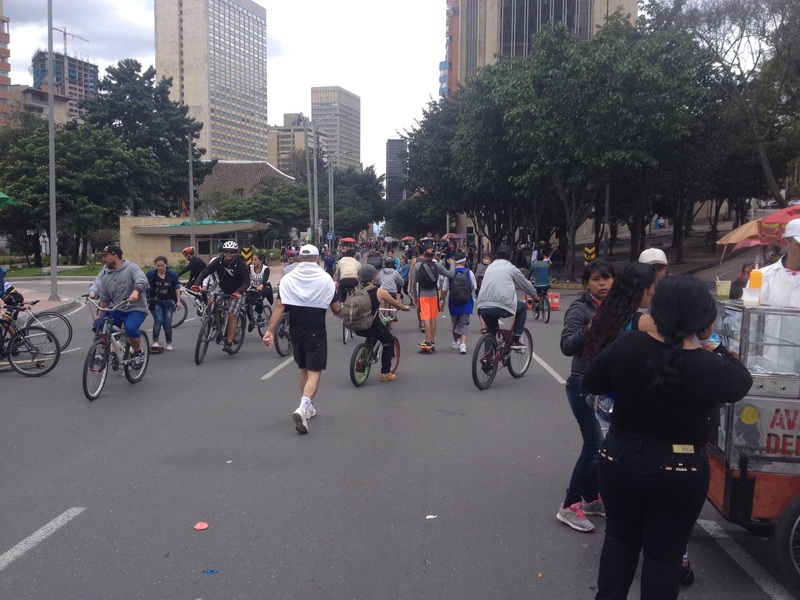 About 121 Kms of the roads were closed on the Sunday mornings in Bogota for people to ride, skate, roller blade, run and do all sorts of acrobatics on the road. It was great to see lots of people out on the road and business was brisk too: fresh fruit juice stalls, local food, bike mechanics, second hand book sellers and just about any thing people can sell; a good opportunity for independent and small businesses. Also, I visited the fantastic gold museum and the church on the top of the Cerro de Monsserate in Bogota. 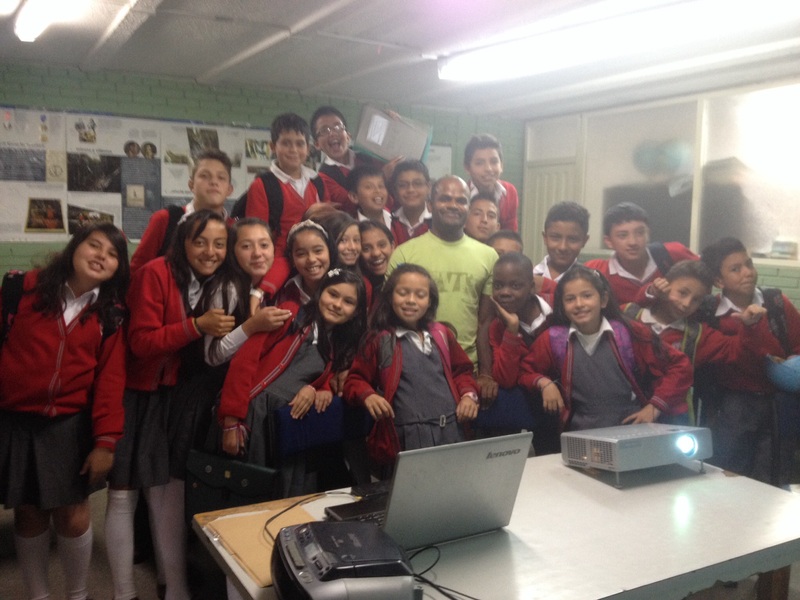 One of the school’s I visited, Colegio IED Miguel Antonio Caro, Bogota, asked me to visit again to talk to more students in their school and I happily obliged. 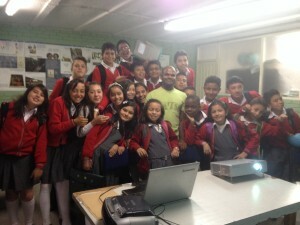 Although, the subject of my talk was the same, I found it interesting in spite of repeating it several times since it was always pupil led in the form of Q and A. Pupils surprise me with some difficult questions for example, “what is the one thing that is most important in your life; do you believe in God”. Something remarkable happened at the end of one of the sessions. A boy approximately 11 years old came up to me and gave some money. I was shocked and did not know whether to accept or reject. I spoke to him for few minutes and decided to accept it in the end. I believe he was very touched by my story. Although this sort of kindness from strangers had happened in the past I was absolutely shocked this time especially considering his age and poor neighbourhood where the school was located. I was beyond words and almost had tears in my eyes and all I could do was to capture the moment in a photograph. 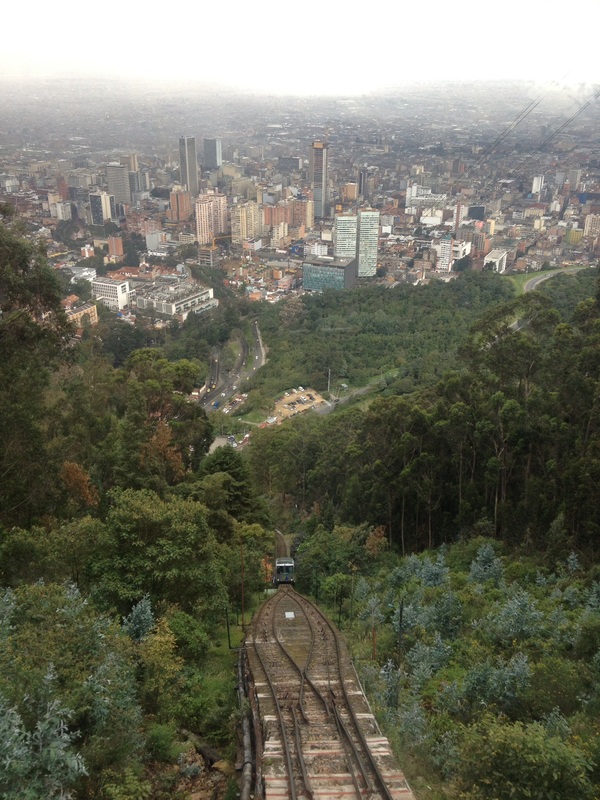 My time in Bogota was well spent, getting my bicycle serviced and restoring my energy. 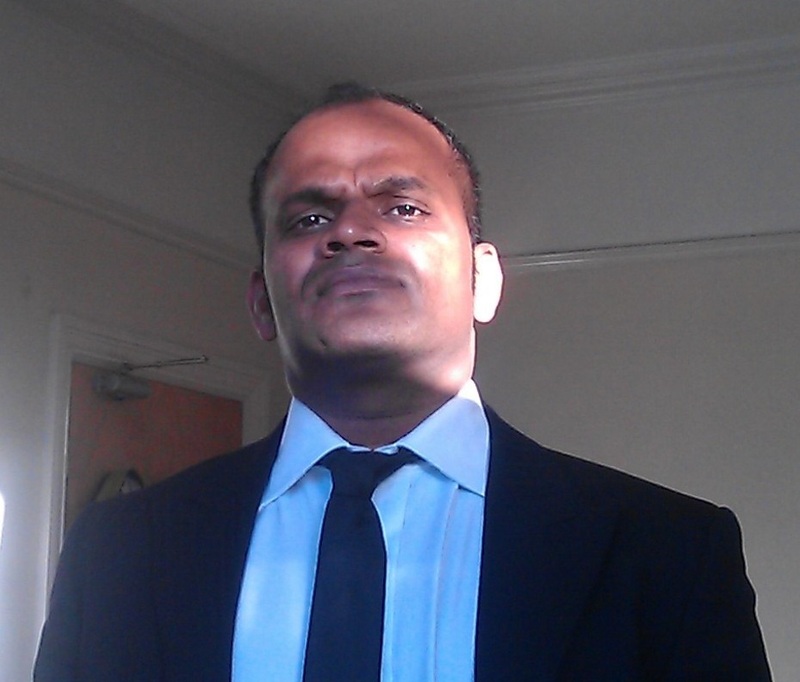 I ate homemade curry almost everyday and that too with basmati rice – I was happy. I felt the itch to get back on my back within few weeks and when the day arrived, I had severe flu the night before so I had to delay my departure by about a week. Meanwhile I was looking forward to one of the climbs called La Linea which was the near perfect equilateral triangle you see in the route profile photo here. This climb is well known among road cyclists in colombia, the second toughest in the country. Climbing to an altitude of 3280 metres the last few 10 kms were greater than 10% gradient. 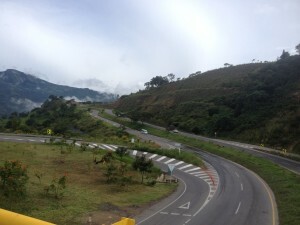 The road from Bogota to Girardot had a lovely shoulder lane which makes the downhill ride (about 2700 to 300 metres) more fun and the fantastic lush green mountains was a feast for the eyes. I did this stretch of 140 Kms over two days. The ascent that followed, to the top of La Linea had to be tackled over three days. 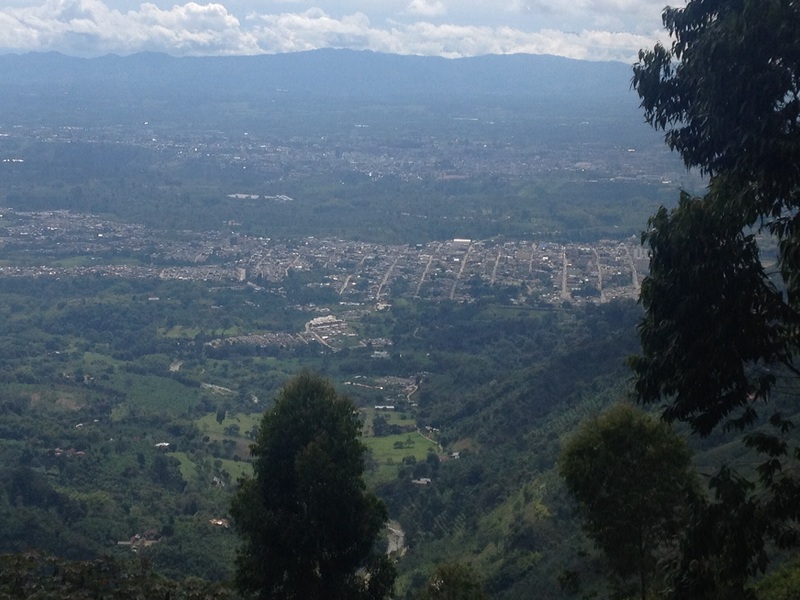 From Girardot to Ibague was a gentle climb, approximately 700 metres altitude gain. 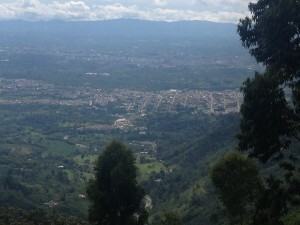 In Ibague my Warmshowers host Logan met me in a panaderia and we stayed at his sister’s place. 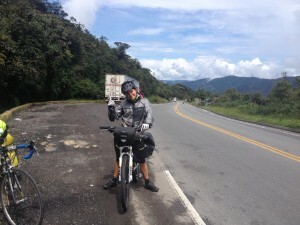 Logan was preparing for a bike ride around South America which he plans to start in June this year. He was excited to receive me and he had all the same questions that I had before my start. Having been in same situation before i started this trip, I could feel his excitement. As a training exercise he wanted to ride with me to Armenia and back, basically the triangle part of the route profile from both sides as if it was not challenging enough to do it from just one side. From Ibague we rode together to Cajamarca about 32 Kms away gaining an altitude of 700 metres with some big undulations. 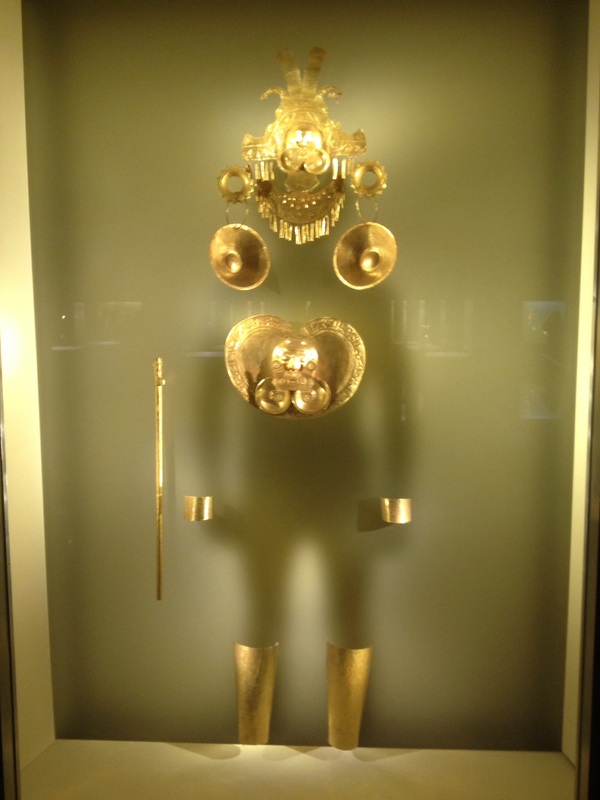 The town of Cajamarca was just a small patch of flat land flanked by big mountains. 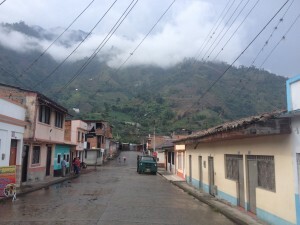 Every street in Cajamarca led to a mountain. 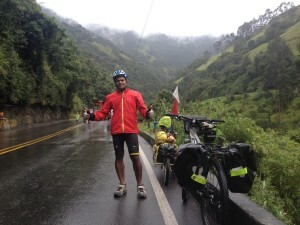 Logan and I stayed at his parents place in Cajamarca and the day to tackle La Linea arrived with rain. Logan’s mom did not wanted us to leave, she was sweet but we knew weather can’t stop us. A distance of 24 Kms to the top was done with lots of huffing and puffing; One of the toughest climbs I have done so far. The rain kept us cooler the whole way. As if by magic, once on the top of the climb, all the suffering was forgotten in an instant. At the end of the downhill on the other side we split. Logan went to Aremenia to stay with his friend while I went to Calarca to stay with my next Warmshowers host. 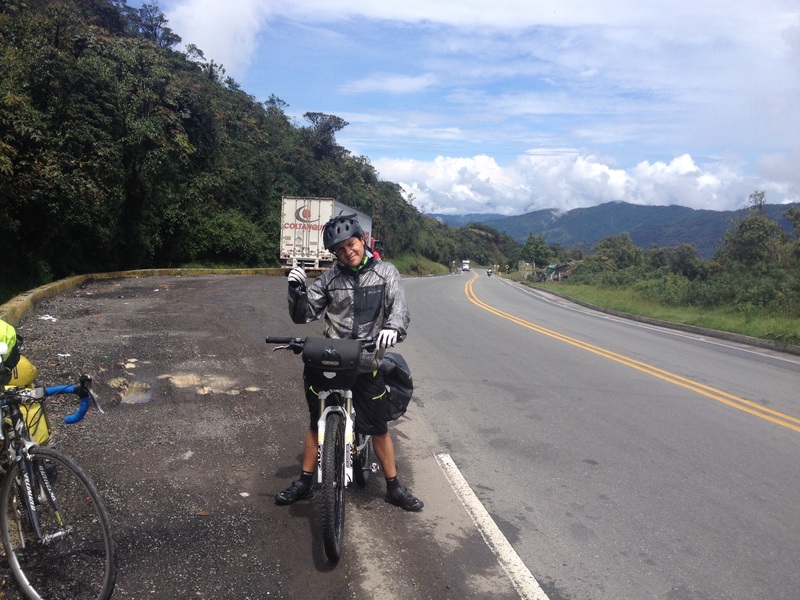 After such a tough day Logan was going to climb the mountain the next day from the other side to be back at Cajamarca; respect! From Calarca it was almost flat until Cali. From Calarca to Buga was about 112 Kms. Buga to Cali saw me ride at 25 kmph and I was pleased to be on my road bike for some brilliant countryside riding. The climax was not good though. Just about a km away from the hostel where I was going to stay in Cali I had a puncture on my trailer wheel. I was not happy to discover the big nail in my trailer wheel and about 6 holes in the tube. With no more patches left, I had to push my bike for the last kilometre. Coffee. 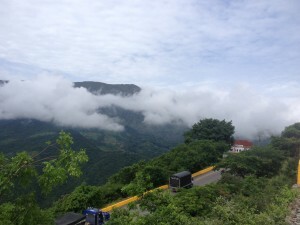 Armenia in Colombia is part of the coffee region and this was a good reason to visit this place. I enjoyed colombian coffee in London for several years. I was expecting to enjoy good coffee here in its homeland. But logical reasons does not work always perhaps. After having been in Colombia for two months, 7 out of 10 times my coffee experience was below satisfactory and coffee connoisseurs know bad coffee is worse than no coffee. I tried coffee in all sorts of places. The local coffee called tinto was prepared using a local made machine which looked the same everywhere. However, the quality of the coffee that comes out was not consistent, dilute and sometimes cold. Coffee con leche was even worse. Nevertheless I kept trying at every possible opportunity; perhaps I am addicted to coffee. I figured out how to request for a good coffee (in Spanish) in the last few days, although people frown upon my request often and will oblige hesitantly. Perhaps good coffee is produced but not made here in Colombia! My time in Colombia is coming to an end. 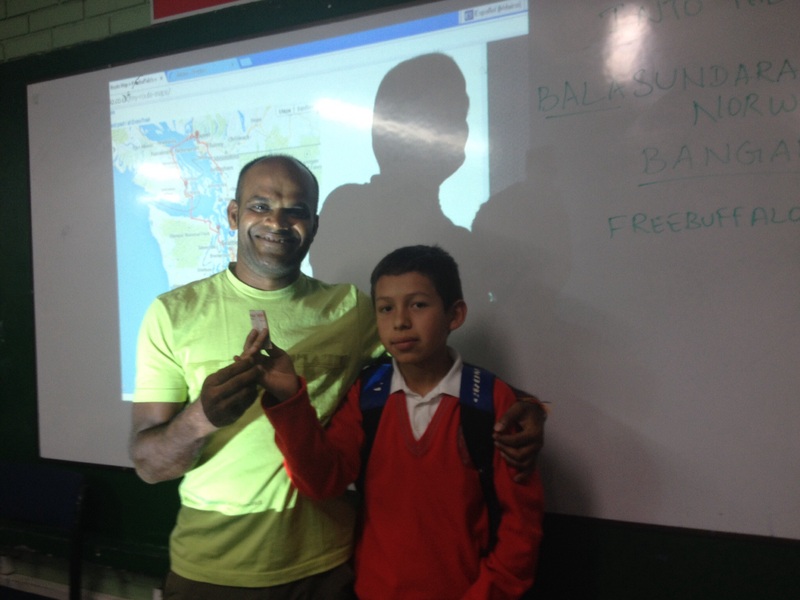 I have just over 10 days before my 90 days visa runs out and also I wish to move on to Ecuador too. I have another 3000 metres mountain to climb over. 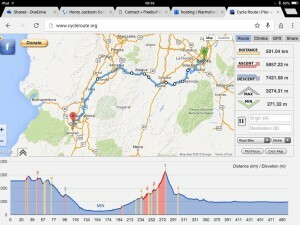 With the clock ticking this climb is promising to be interesting. Good to see Free Buffalo climbing the hills! Hope you find some good coffee somewhere! Those calves are looking strong bala. 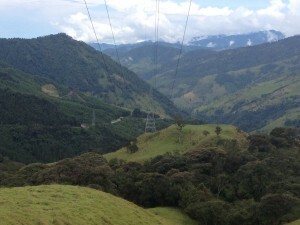 The Colombians mountains will make my calves stronger if not!